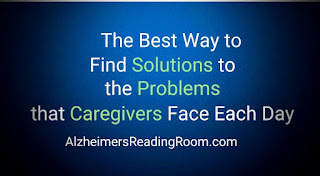 Our reader Pat, an Alzheimer's caregiver, is dealing with a problem that is more common than I would like to admit. Not being recognized by a loved one is both gut wrenching and heartbreaking. I know because I have talked about this in person with hundreds of caregivers. "When my husband doesn't recognize me, he keeps asking where is Pat his wife. If I tell him I'm his wife Pat it irritates him and he says no I'm not his wife. I can't seem to satisfy him no matter what I say. Hope u have a good answer for me. He keeps asking where is his wife?" I asked our top expert Dr. Rita Jablonski to respond to Pat's question. She does that here in Part 1. I'll tackle this issue in a different way in Part 2. While there is never a perfect solution to an individual problem, I always reminded myself while caring for Dotty that - "where there's a will there's a way." Sometimes you have to try multiple solutions before you discover what works best. First, I’m sorry. Not being recognized by someone whom you love hurts, but you already know that. I have some suggestions and I sincerely hope one of them will work. We all have mental “pictures” of what the people we know look like. We also constantly update our mental pictures of people in our lives while retaining the old ones—a “deck” of mental pictures filed in our brains. I see Jackie monthly, so my mental image of her is always recent. But if I have not seen someone in a couple of months, and that person significantly alters his or her appearance, I may not recognize that person. I recently ran into a colleague at a conference who had lost over a hundred pounds. We see each other yearly. I walked right past this person, because my mental image of him was extremely different from the person standing in front of me. A similar thing occurs with people who have dementia. The person with Alzheimer’s disease or another dementia loses the most recent memories first. As the dementia worsens, memories from last year disappear. Then, memories from five years go away. Next thing you know, the deeply forgetful person is looking for “the kids” and wondering where “Mom” is right now. Your husband is moving back in time. He is looking for the “Pat” from 30 or 40 or 50 years ago. He may be looking for Pat at age 30 or younger. By the way, this is the main reason why people who are deeply forgetful may start calling an adult child by the spouse’s name: the adult child at age 30 or 40 may strongly resemble the spouse at the same age. There is another step going on with people’s memories. The brain works by placing memories in different sections and “linking” the pieces to each other using nerve cells. I picture a fishing line or string connecting different memories to each other, with the string passing through the innermost part of the brain (where the hippocampus, amygdala, and other structures are located). Another way to think about this is a long strand of beads on a string, with the beads representing pieces of memory. The string is woven throughout the brain, with pieces of memory attached at various points. If I tug on the string at any point, I pull all of the pieces of one memory, or sometimes more, toward me. This is why the smell of a pine-scented candle can bring back a flood of memories from multiple Christmases—the odor pulled on the string and a slew of memories were retrieved. Back to your husband, Pat. There may be one of two things going on here. The first, and the one I’m hoping is happening, is that he has lost HIS ACCESS to the complete deck of “Pat” cards. Out of his deck of Pat cards, he only has access to the ones from a long time ago. The string may be broken in sections because of the death of nerve cells that happen with dementia. But the brain is a wonderful thing: there are usually hundreds, maybe thousands, of alternative strings and connections. You may be able to help your husband recognize you by pulling on different strings and bringing the most recent image of you back to your husband’s memory. Find a picture of the both of you from long ago. Perhaps a wedding picture, or a picture from a memorable vacation or event (birth of a child). Why write the names and event? Reading is an over-learned skill, meaning that it may be among the last abilities to go. Plus, reading is important in making many of the memory strings and can help tug on the string at other points where the string is not damaged. Second, emotions often make strings of their own that are woven throughout the memory pieces. This is why we all remember where we were on September 11, 2001. Does anyone recall where he or she was September 9, 2011? Probably not … unless September 9th was connected with a significant, emotional event. BEFORE your husband starts asking, “Where is Pat?” show him the top picture. Then show him the bottom picture. Then smile and say, “I’m Pat.” This may take multiple tries as your husband’s brain tugs on various strings until the current picture of you pops up. Yay! You have helped him get to his deck of Pat cards. 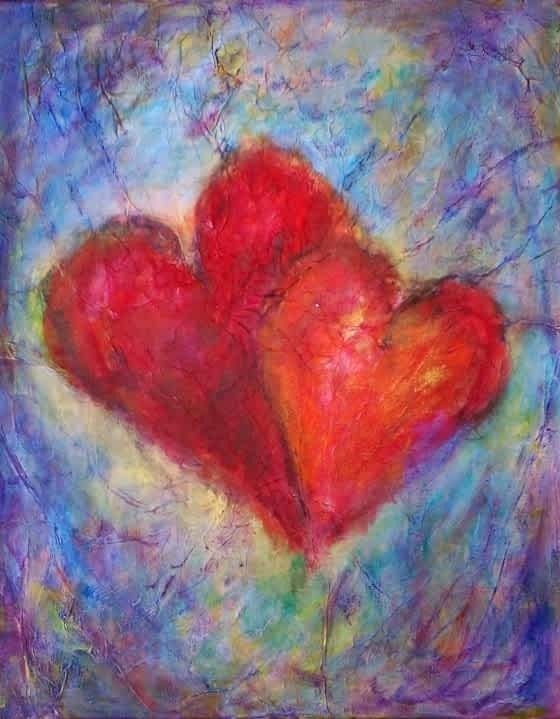 It is possible that your husband’s dementia is so far advanced that most of the deck of Pat cards are gone … the nerve cells that contained those memories have died. In that case, you have a couple of other ways to handle his questioning. Think back: was there a time in the remote past where you two were apart for a good reason? Her family responded by telling her that her spouse was dead and they would show her a picture of his headstone. She would burst into tears and be inconsolable for hours. Even when she forgot about this interaction, all of us on staff would note that she would remain agitated until bedtime. I learned from her family that her husband was a career Navy officer. One day, when she asked about her husband, I replied, "He is deployed". Would you like to sit with the other wives and wait for dinner?” She smiled and nodded. From that point forward, every time she asked where her husband was, we would respond that he was deployed. This was a satisfactory answer FOR HER (everyone is different) and it made sense based on her memories and her current reality in Dementia Land. People with dementia are often trying to make sense out of a frightening or very confusing situation. By reminiscing with you, he may start reliving very positive memories of your times together. This is often comforting to people who are deeply forgetful. 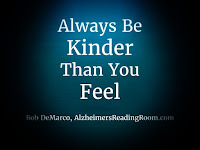 Bob often writes, “Be kinder than you feel.” I echo this message, because people with dementia are very tuned into our energies and our vibes. Your husband will continue to respond to your gentleness and kindness. As you become less upset about the situation (and it is upsetting) because you have options and ways to respond, he will eventually settle down, too. I hope these suggestions will be helpful. Please let me know how they worked out. Even if the ideas did not pan out ideally, your husband’s responses may offer additional clues for other strategies.